Social network use among Internet users 50+ years old has nearly doubled to 42% over the past year. In the U.S. alone, there are nearly 16 million people 55+ years old using Facebook. e experiences with strangers and new friends over the Internet. In fact, more often then not, the reason that older people don't use social media ISN'T because of lack of interest, but instead because social media platforms have not been developed with these older people in mind. 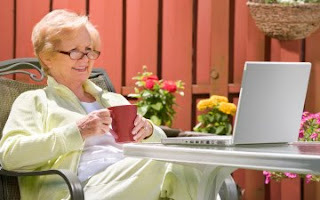 When these new technologies and social media platforms are ready for use by the public, education is key to ensure senior citizens don't fall behind and become victims of the "digital divide"
In the end, senior citizens may be "old," but if companies want to maintain (and even increase) their success, they will need to develop social media strategies that allow senior citizens to easily use the platforms and technologies available to them. I agree that companies need to start focusing some attention on the baby boomer generation. Taking the fact that my parents are baby boomers and are just starting to embrace newer technologies, I am seeing the trend firsthand. Companies should also be aware that the baby boomer generation has built its brand loyalties on just that, loyalties. They could build and maintain their loyalty through social media very easily. I agree with the comment above me. The baby boomer generation is just now becoming comfortable with social media, and marketers need to understand this and take that into consideration when creating new social media campaigns. With social media becoming the norm now, companies need to take advantage of the opportunity to reach the older audiences. Of course like you stated they'll need to switch up the ways that they reach the baby boomers as opposed to the younger demographics. From what I've seen older generations are more attached to a brand and if they feel that they can have a working relationship with that brand through social media then they will be more likely to purchase that product more often.